Fig. 11-4. Single-Axis Attitude Determination Methods. In each step, the independent variables are underlined and the variable being solved for is circled. notation for the various methods. The steps used in evaluating the attitude for each method are given with the known observables used in the computations. The circled variables represent the parameters being solved for in each of the steps. For example, in the Earth-width/Sun angle method, spherical triangle A HE is used in step 1 to compute the nadir angle, 17, with twofold ambiguity. The computed values of 17 are then used in step 2 to calculate the attitude with fourfold ambiguity. For each method, at least a twofold ambiguity may remain, and this may be resolved either by comparison with an a priori attitude or by the-block averaging process described in the next section. In principle, any of the six methods can be used alone to determine the spacecraft attitude. In practice, however, all of the applicable methods are normally used and the final attitude is taken as some weighted average of the results. The principal reasons for this redundancy are: (1) to ensure that a solution is obtained when some types of data are not available because of hardware or software malfunctions, (2) to reduce the effect of possible biases or other systematic errors by using methods which vary in their dependence on the observables, and (3) to aid in the identification of biases and estimation of the size of systematic errors by comparing the various solutions throughout the data pass. (See Section 11.5 for a further discussion of the latter procedure.) The principal disadvantage of using multiple solutions is that it makes the correct statistical treatment of the variables more difficult because a single measurement, such as a Sun angle, enters several calculations and is formally treated as an independent measurement each time it is used. The nadir angle is determined with twofold ambiguity. The intersections of the nadir cone and Sun cone shown in step 2 are then used to compute a maximum of four solutions for the attitude using utility routine CONES8 (Section 20.3) or the analytic procedure described above. Unlike the single Earth-width method, this method provides an unambiguous nadir angle, tj. The analysis now parallels the single Earth-width method described above. As shown in step 2, A is constrained to lie at the intersections of the nadir cone and Sun cone and may be obtained using either CONES8 or the analytic procedure. certainties between the observables. Equation (11-9) generally should not be regarded as the statistically best estimate of t>. The methods discussed in this subsection make use of the midscan rotation angle, or the rotation angle from the Sun vector to the nadir vector, measured about the spin axis. Typically, this angle is observed by measuring the in-crossing and out-crossing rotation angles separately and averaging them. 3. Earth Midscan Rotation Angle/Sun Angle Method. ' The attitude observables used are S, E, /?, and 4>. Referring to the attitude geometry shown in step 1 for this method, we see that the law of cosines for sides may be used on spherical triangle ASE to compute the nadir angle with twofold ambiguity. Thus. Step 2 shows that the attitude is constrained to lie at the intersection of the Sun cone and one of the two possible nadir cones. CONES8 may therefore be used to compute up to a maximum of four solutions, which may be decreased to two solutions by comparing the observed midscan rotation angle and calculated values for this angle using each of the four possible attitude solutions. Only two of the four attitudes will yield the correct value for 4>. The two possible Sun cones and two nadir cones may be combined, as shown in step 3, to yield a total of eight attitude solutions from CONES8. Comparison of observed and calculated values of 4> reduces the number of solutions to four. 5. Dual Earth-Width/Earth Midscan Rotation Angle Method. This method requires simultaneous Earth coverage by two Earth sensors. Hie attitude observables are S, E, 0,, Oj, p„ p2, y,, y2, and 4». The analysis for step 1 of this method parallels the dual Earth-width /Sun angle method and, hence, Eq. (11-9) may be used to calculate an unambiguous value for the nadir angle. Step 2 shows how this nadir angle may be combined with the observed midscan angle to compute a Sun angle. 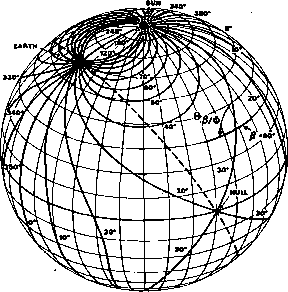 This computation parallels that described above in step 2 for the single Earth-width/Earth midscan rotation angle method. Hence, Eq. (11-11) may be used to compute the Sun angle. Using CONES8, the two possible Sun cones and nadir cone are combined to calculate four solutions for the attitude. The fourfold ambiguity is reduced to two by comparing the observed and the calculated $ angles. Step 2 shows that CONES8 may be used to solve for the horizon vector, H, using the arc-length measurements ip and p. Two solutions are obtained for H. Step 3 shows the application of CONES8 to triangle ASH using as reference vectors S and the two solutions for H. A maximum of four solutions are obtained for the attitude. Two of these solutions are rejected by comparing observed and calculated values for 4>. Throughout the foregoing discussion we have tacitly assumed that the various cone intersections always produce an analytical solution. However, in the presence of biases and random noise, the possibility arises that the pair of solution cones do not intersect, or that arc cosine and square root functions are undefined. There are two methods for obtaining a solution in this-case. One method is to input some predetermined bias, such as a sensor mounting angle-bias or Earth angular radius bias. This change may produce the desired intersection and an attitude solution. Alternatively, we may force the cones to intersect by computing a fictitious intersection point midway between the cones at their point of closest approach. If the necessary change in the arc-length measurements which define the half angles of the two cones exceeds a given tolerance, the forced solution is rejected. Application of the detehninistic attitude methods described in Section 11.1 to a span of data results in a set or block of attitude solutions consisting of several attitude estimates for each data frame. The number of attitude solutions for a frame depends on the number of valid methods used in processing. For example, the deterministic processing subsystem for the CTS spacecraft [Shear, et al., 1976], can in principle use up to 12 methods and return a maximum of .2 ambiguous solutions for each processing method. This section describes qualitatively how the method of block averaging may be used to resolve the ambiguous solutions and how the resultant block of chosen attitude vectors is averaged to provide the best estimate for the spin vector. Block averaging requires only that the true solution vary more slowly with time than the false solutions in the ambiguous sets. Therefore, it has general applicability and has been used in evaluating the pitch, roll, and yaw angles of the three-axis stabilized RAE-2 spacecraft as well as the spin axis right ascension and declination of spin-stabilized spacecraft such as AE, CTS, SMS, GOES, SIRIO, IUE and ISEE. Data Weighting. As the first step in the averaging process, a weight, W, is assigned to each individual attitude solution within the block. The weight for any one solution is the inverse square of the arc-length uncertainty for that solution. Several methods for calculating the single-frame arc-length uncertainties are described in Sections 11.3 and 12.3. The forced attitude solutions described in Section 11.1.3 are arbitrarily assigned a small weight to minimize their contribution to the averaging process, except for cases in which only forced solutions are available. Resolution of Ambiguous Solution and Block Averaging. Several methods are available to select the true solution from a block of data containing ambiguous solutions. The first method is to compare each set of ambiguous solutions with an a priori value for the attitude and to select the solution lying closest to this initial estimate. If no a priori estimate is available, an alternative procedure is to plot all of the attitude solutions in a right-ascension-versus-declination plot, as shown in FigS. 11-5 and 11-6. The set of correct solutions should form a cluster, because the correct attitude is assumed to remain approximately constant; the incorrect solutions from each of the ambiguous sets will usually be more scattered, because the geometry of the incorrect solutions changes as the orbital position of the spacecraft changes during the data pass. Any attitude near the center of the cluster may then be used as an a priori attitude for the subsequent elimination of ambiguous solutions.